Bonefish near South Caicos. There's amazing flat fishing and reef fishing in the Caicos Islands. 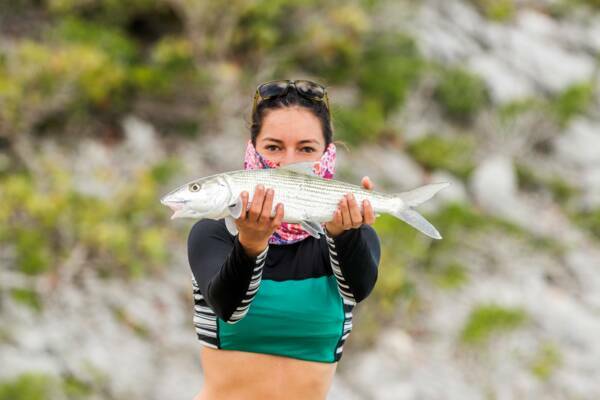 South Caicos is an amazing destination for bonefishing. Since the abandonment of the sea salt industry in the mid-1900s, small-scale commercial fishing has been the mainstay of the South Caicos economy. The nearby Turks Islands Passage and several marine banks offer great potential for sport fishing. As is increasingly being known, the extensive Caicos Banks shallows off some of the finest salt water flat fishing in the region. South Caicos is ideally situated to access these excellent fishing sites. Bonefish, tarpon and barracuda are plentiful. Due to the very shallow depths at many sites, fan boats are best suited for the conditions. There are several viable spots for shore bonefishing as well. The regions of Bell Sound north of Cockburn Harbour is outside of the national park is accessible and decent. The flats west of the abandoned US Coast Guard’s LORAN base should also be considered. The pursuit of edible snappers, groupers and jacks has always been both a necessity and a pastime on South Caicos. Excursion options do exist, yet are still a bit limited. Multiple day packaged can be arranged and offer greater value. During calm weather and ocean conditions, Highlands Bay and Valley Bay Beach is a great shore fishing spot. Plandon Cay Cut Beach can offer great conditions at times as well. As the tourism industry on South Caicos is quite limited, deep sea sport and bill fishing has never caught on. Conditions are prime, yet it is necessary to make the short island hop by plane to either Providenciales or Grand Turk to find a properly-outfitted water sports operator. It is illegal to fish in any national park or nature reserve in the Turks and Caicos. There are three such areas near South Caicos that should be taken into consideration. The shallow wetlands of the Bell Sound National Park should be taken into consideration when bonefishing in the greater Bell Sound region. There are several viable spots in the area, but avoid the national park. The Admiral Cockburn Land and Sea National Park consists of Long Cay, Dove Cay, Six Hills Cays, Middleton Cay and the South Caicos coastlines of Shark Bay (Gannaway Bay) and East Bay. A Ramsar protected wetlands site consists of much of the south sides of North Caicos and Middle Caicos, and small portions of East Caicos. The Ramsar site is quite a distance from South Caicos, and typically does not interfere with the usual fishing trip. There are proposals to allow for responsible catch and release bonefishing in national parks and nature reserves. If passed, extensive shallows off of East Caicos and in Bell Sound would be open for fishing. It is expected that these changes may take place in early 2016. Fishing licenses are required in the Turks and Caicos. Daily and monthly licenses are available. The costs are $10 and $30. Fishing tour businesses typically include licenses with excursions. If possible, when DIY fishing we recommend obtaining your license on Providenciales (all international flights land at the PLS Airport) or Grand Turk before continuing onto South Caicos. Although not guaranteed, it’s typically possible to arrange for a license in Cockburn Harbour on South Caicos. Last reviewed by an editor on 8 January 2019.